Map Warper is a tool that allows you to georectify maps. Georectification involves matching control points to align the map image with an existing coordinate system. After plotting corresponding points, the tool warps the historical map (using an algorithm) so that it lines up with the contemporary OpenStreetMap. For our purposes, it will allow us to build historical map layers, which we can use to examine changes in space and place over time. For today I’ve selected historical maps of Washington, D.C. from the David Rumsey Map Collection. Click “Export” and download the highest resolution image. Click the “Rectify” tab. 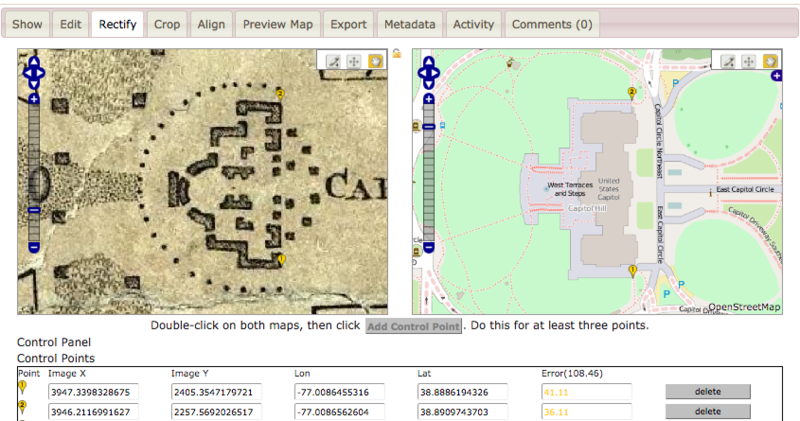 In the side-by-side interface, you can navigate between each map using the mapping tools on the left. 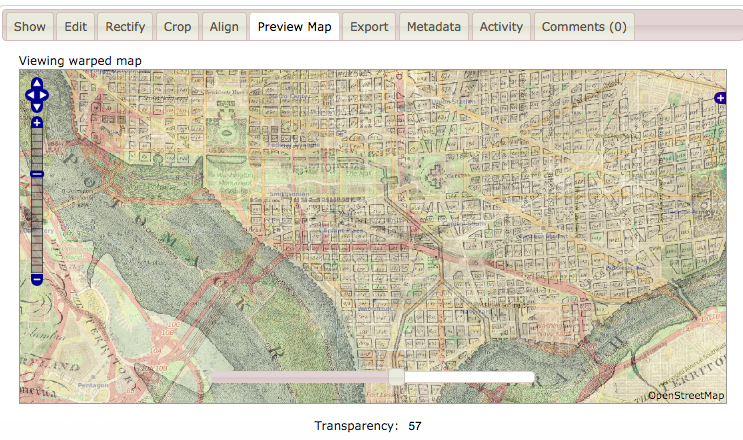 In both map windows, navigate to Washington, D.C.
Navigation: Click the white triangles to move up/down/left/right. Zoom: Click the plus or negative signs to zoom in or out one step. Move the blue slider button to move multiple steps at once. (Note: you may also use your mouse/trackpad to pan and zoom). Add Control Point: Click the small pencil button to add points. Click again on the map to place the marker. Move Control Point: Click the arrow button to edit control point positions. Click again on the point to move it. Click to place the point in the new position. Move Around Map: Click the small hand button to easily move around the viewer. Click, hold, and drag to slide the map around. Release to place it. Below the map images, click “Control Points” to see a list of points. Click the “Export” tab to use your map. For our work, the WMS (Web Map Service) and Tiles capabilities are most useful for use with CartoDB and Neatline. WMS – use the URL to add map layers in CartoDB and Neatline. Tiles – use the URL to create tiles in CartoDB. For more info see the Carto blog.